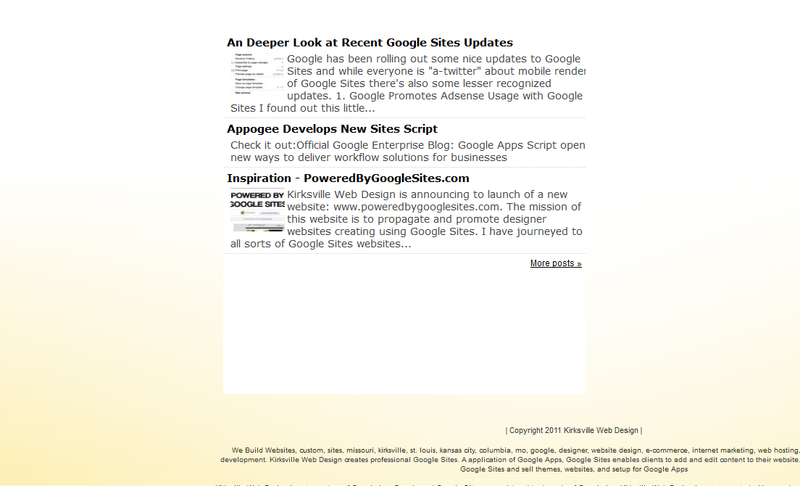 Web Design with Google Sites: RSS Feed for Google Sites! I was struggling just weeks ago trying to create a RSS feed that looked decent and accomplished what should be a simple task. This minor update caught me by surprise and I am happy to see it. 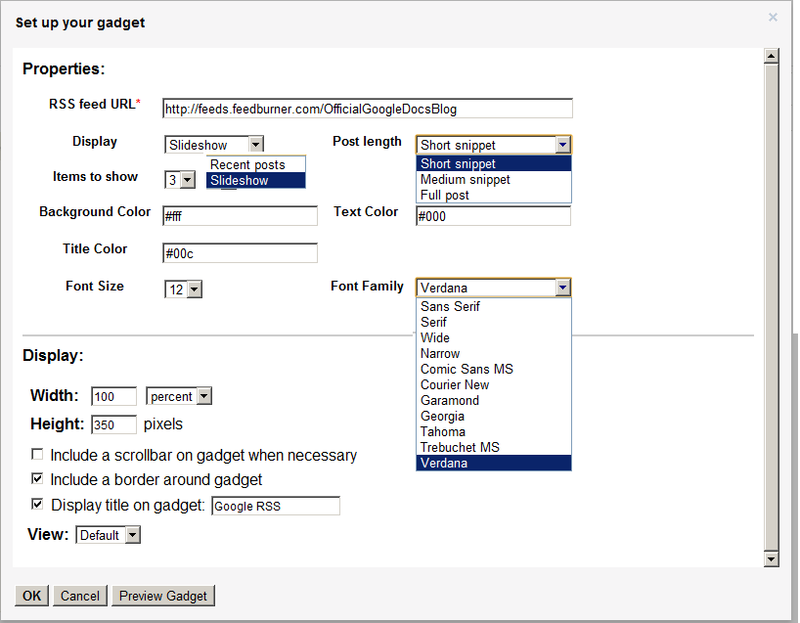 I was using FeedWind to accomplish a RSS feed through an iframe, that means my html was hosted with a third-party and embedded onto the webpage via Mori79's iframe gadget (search iframe under public gadgets and it is the first one). The Slideshow Option. 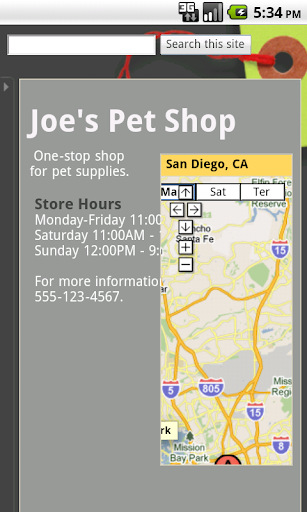 Not terribly useful, but nice. Anyways, no more iframes, just a customizable, easy to use Google-endorsed gadget. We at Kirksville Web Design have already fully tested out this gadget including the interesting display feature, slideshow. The slideshow only shows the title as a link and a thumbnail. It's not the most useful or aesthetically pleasing, but I'm all for options here. No Transparency Allowed on Hexcode for bg color. Here's the original post below. Enjoy! I could not find RSS Feed after 10 mins of scrolling the results of such gadget search. Any chance you could post a direct link please? I found it, but how do I get it to auto-refresh??? I don't want to be refreshing the page by myself, or asking my users to do so.. 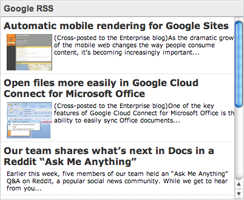 Your RSS feed gadget is simple and clean, exactly what I've been looking for! However, when I click on the "more posts" button, I'm sent to: http://tumblr.superfeedr.com/, with some directions for real-time notifications that I don't understand. How do I get the "more post" button to work? 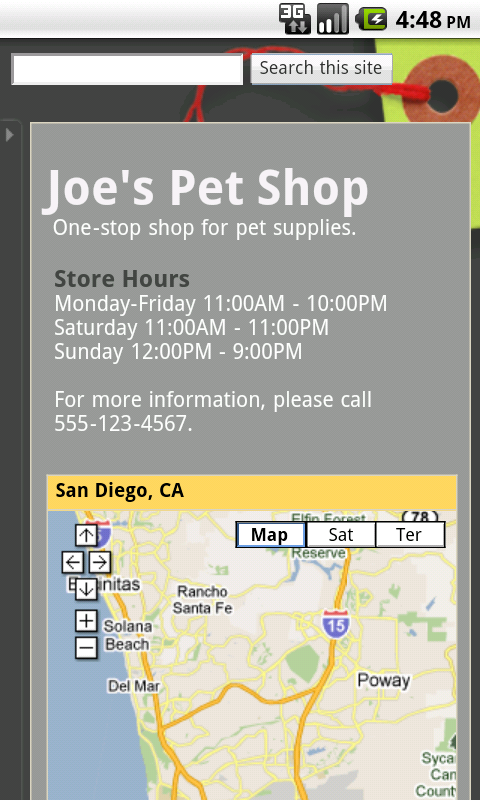 But it will only show it with Blue text on a white background no matter what options I add to it. Am I missing something or is there a problem? Having the EXACT same problem as Doug. Extremely frustrating. Same here. "No feed URL is set”. Working on something to release soon to fix our problems! 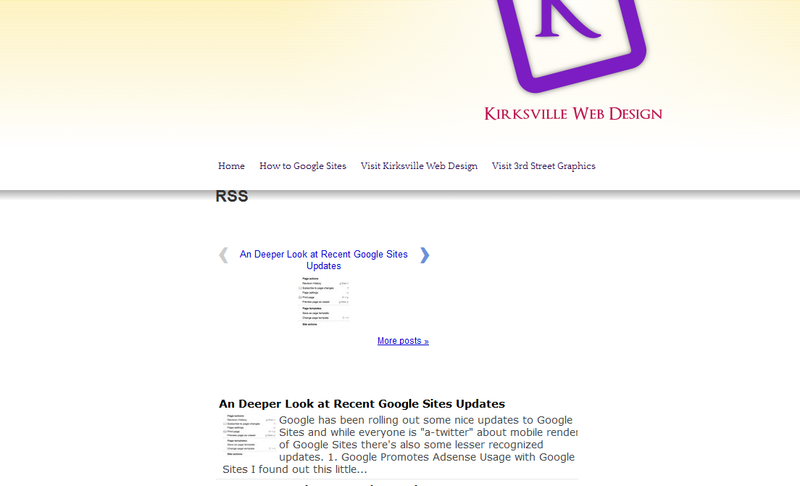 Is it possible for an RSS feed to work when Google Site sharing is set to 'anyone with a link'? THX Kyle for the post here. I had the problem on my German Google Sites and tried to implement you solution (by default there was no integrated RSS-Feed like on the English version), but no success. So, after a few hours of experimental work I got a damn simple solution and anyone who likes to implement it is welcome. 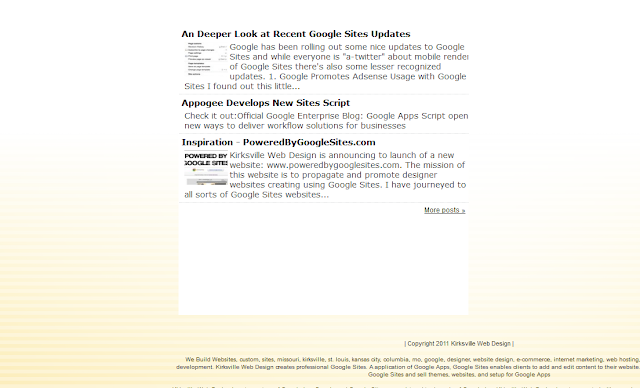 The site is private and it works there like charm. I was wondering how to do this, I have one Google Site and wasn't sure how to do it. Look forward to more posts like this! The best thing i got in RSS gadget it can help us to control the apearance of the gadget and we also change in the graphics and in this way our website getting more new information technology attraction of the visitors. Very imformative things you discuss in this blog. Thank you for the blog.